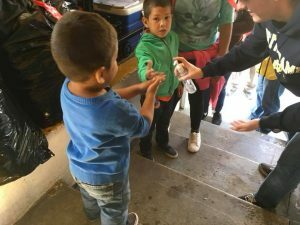 On their monthly day-long immersion at the KBI, students from Brophy College Preparatory volunteer in the comedor—serving food, greeting migrants, and, here, helping children clean their hands before meal time. Photo by Sister María Engracia Robles Robles, M.E. This month, we share details about recent KBI travels and immersion visits in March, one of the busiest months of the immersion calendar. The KBI on the Road: Director of Education and Advocacy Joanna Williams visited Fordham University in New York from March 26–28; her upcoming trips include attending an April 23–25 meeting about Jesuit works related to migration in El Paso, and presentations at Seattle University, April 30–May 2. From April 5–7, Father Sean Carroll, S.J., Executive Director, was at the Holy Family Parish in Inverness, IL, and on Tuesday, April 9, gave a panel presentation as part of the Diocese of Matamoros’ 60th anniversary celebration. Father Sean will be in Portland, Oregon for a presentation at Central Catholic High School on Friday, April 26. Immersion Experiences: High school and college students from across the U.S.—many on their spring breaks—joined the KBI for immersions in March.